Recently I received an amazing gift box from my very talented friend, Shelly Rollins of Bunglow Bling. I was one of the fortunate recipients of her latest Give Away, and I just had to share all the beauty that came from that package. 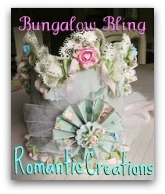 Shelly creates wonderful romantic party accessories; from crowns, garlands, and cake toppers to lace jewelry. Her attention to detail is what makes her one-of-a-kind jewels so sought after. Just one of her many beautiful pieces, this "Paris" themed hanging cone. This was such a special surprise, filled with wonderful bits and bobs of lace and ephemera; I gently removed each piece of loveliness. Scrabble tiles say it all, Shell. Sweet birdie that will be moving into one of my nests. Please run by Shelly's blog and take a peek on her sidebar of all the pretty things to choose to make your next party honoree feel like a Queen. You won some amazing goodies Debra! Congrats!! Such a lovely package, Debra! Especially love the pretty cone! Lucky you!! Debra, What a pretty gift from Shelly. Congrats to Honey for winning your giveaway. Congrats to Honey! What lovely gifts you received from Shell, Debra! They are all so beautiful ~ just love the crown and Paris cone. Wow, you must have been over the moon! I would have been. I love what you won! I think you should wear that crown on your next birthday! Ha! Congrats on your win, Debra. Beautiful stuff. Congrats to Honey, as well. Lots of beautiful eye candy, Debra! Congrats to you and to Honey, too! OH Debra, you won, real beauty, how wonderful is that crown filled with lovely bits. The angel in front is so adorable. congrats, debra, on the adorable goodies! and honey, too! Congrats Debra, the crown in just adorable, such wonderful goodies! Congrats Honey on your gift certificate! WoW! You must feel like "Queen Debra" with all those exquisite handmade delights!!!Congratulations! Congratulation of your fabulous win!What a wonderful crown of beautiful goodies! Thank you, Debra, and Dee at French Bleu Vintage, for the fabulous $50 gift certificate. What a surprise! I am so fortunate, thrilled and thankful! What wonderful treasures to be surprised with. Shelly has created beautiful things, so original! I'm going right now to check her out. Thanks for sharing your gift box. Love it! Congrats to you and to Honey! All those items you received are just so pretty. I love them all! I wanted to let you know I gave you a special thank you on my blog tonight. I sold my first Etsy item due to your Marketplace Monday party. Thanks so much!